I’m officially endorsing cake for breakfast. Not all cakes, of course. If you’re snarfing down a slice of triple-layer chocolate cake at 9 am, I don’t want to hear about it. This cake is so loaded with carrots and apples that there’s barely enough batter to hold the healthy ingredients together. 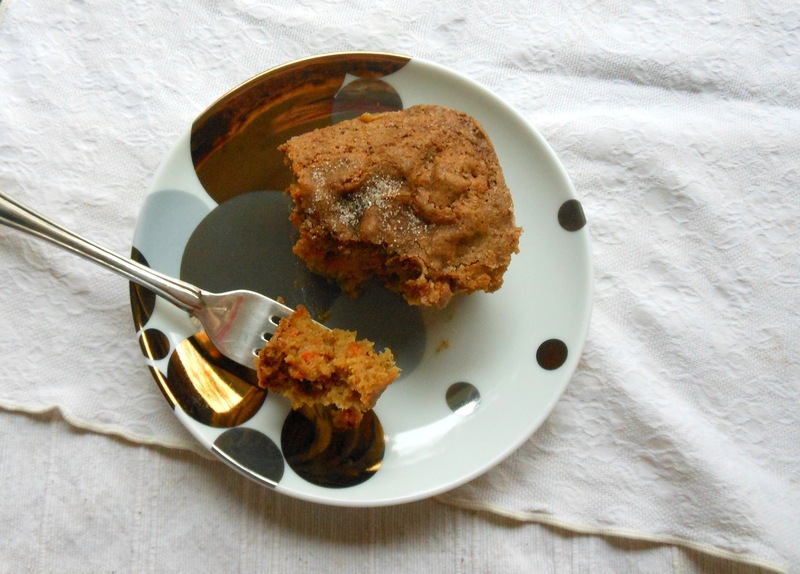 The resulting confection is as flavorful as carrot cake, but lighter and with much less oil. The cooked carrot shreds are just slightly chewy, while the apples are tender. Brown sugar lends a caramel undertone and the spices add warmth. My mom makes this cake with Granny Smith apples, no carrots, and with 1 1/4 cups white sugar. My friend Leona makes it with grated apples, not chunks, and bakes it in a larger pan for a denser, more bar-like treat. I usually add a few handfuls of chopped walnuts or pecans, but I simply forgot this time. Sometimes I add raisins or dried cherries. I’m thinking some shredded coconut would be fantastic — next time I’ll try that. I peel the apples because I find cooked apple skins to be tough, but if you don’t mind them, feel free to leave them on. I used locally grown Gala apples because that’s what I had; the cake’s equally good with McIntosh or my mom’s favorite Granny Smith. The combination of cinnamon, nutmeg and ginger is warm and rich, but you can certainly just use cinnamon if that’s what you have on hand. Grease and flour a 9-inch cake pan (round or square). Heat the oven to 350 degrees F.
Mix carrots, apples, and the sugars; set aside. In a small bowl, stir together the flour, baking soda, salt, and spices. In a large bowl, whisk together the eggs, oil, and vanilla. Stir in about a third of the dry ingredients just until barely blended. Stir in half the carrot-apple mixture, then another third of the dry ingredients, then the rest of the carrot-apple mixture, and finally the last of the dry ingredients. Scrape the batter into the prepared pan and bake for about 50 minutes until a skewer inserted in the middle comes out with just damp crumbs clinging, not batter. This moist cake is best eaten within a few days, but it’s too tasty to last longer than that. This entry was posted in baked goods, sweet stuff and tagged apples, cake, carrots, dessert, healthy, snacks, vegeterian. Bookmark the permalink.